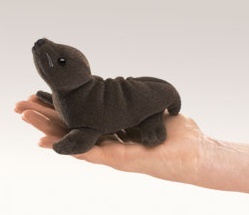 The Folkmanis sea lion finger puppet was released in late August 2010. This finger puppet is all brown with black eyes and nose. The whiskers are made of clear plastic line. The puppet is 5 inches long and 4 inches tall (12.7 x 10.2 cm). Discontinued in March 2015. Limited stock. 1 per customer.